Glenn Ford (May 1, 1916 - August 30, 2006) was an American actor, born in Canada. Born Gwyllyn Samuel Newton Ford in Quebec City, Canada. He son of a Canadian railroad worker. Glenn studied at Santa Monica High School. After graduating he started working in small local theaters. Glenn Ford also joined the Naval Reserve United States in 1958 and was promoted to lieutenant commander. Ford touts the Navy through radio and television spectacles. He was promoted to captain in 1968. Glenn Ford was married four times, and a son, Peter Ford. He died at 90 years old on August 30, 2006 at his residence of Beverly Hills. His first movie work, was a short Night in Manhattan (1937). He is remembered for playing the role of Johnny Farrell in Classic movie Gilda (1946), with Rita Hayworth. His long list of movie include The Adventures of Martin Eden (1942), The Doctor and the Girl (1949), Plunder of the Sun (1953), Torpedo Run (1958), Experiment in Terror (1962), Four Horsemen of the Apocalypse (1962), Dear Heart (1964), Is Paris Burning? (1966), Midway (1976). He also participated in the movie of 1978 Superman, playing the role of Jonathan Kent Superman's father. Among his most notable roles are that of the incorruptible Detective. Sgt Dave Bannion, who must fight against the Mafia, in The Big Heat (1953), also he played role of school teacher who is harassed by his students in Blackboard Jungle (1955). He has starred in big Western movies, in the history of Hollywood as Texas (1941), The Desperadoes (1943), with Randolph Scott, The Man from Colorado (1948), with William Holden, Lust for Gold (1949), The Redhead and the Cowboy (1951), The Man from the Alamo (1953), The Violent Men (1955), Jubal (1956) , with Ernest Borgnine, The Fastest Gun Alive (1956), 3:10 to Yuma (1957), Cowboy (1958), The Sheepman (1958), Cimarrón (1960), A Time for Killing (1967), The Last Challenge (1967), Day of the Evil Gun (1968), and Heaven with a Gun (1969). His latest western movies are: Santee (1973). In 1962 Glenn Ford won a Golden Globe, as best actor for the movie Pocketful of Mir, directed by Frank Capra. For his outstanding career in the movies, Glenn Ford star on the Hollywood Walk of Fame at 6933 Hollywood Boulevard. He was also inducted into the Hall of Fame Western artists at the National Cowboy & Western Heritage Museum in Oklahoma City, Oklahoma. In 1971 he starred in the CBS television series Cade's County, he plays county sheriff Sam Cade, is a must fight against crime. in this series works the son of Glenn Ford, Peter Ford. 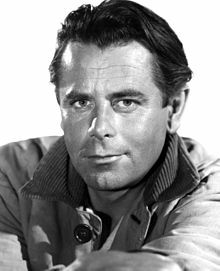 Glenn Ford has had great performances in movies and series for television The Brotherhood of the Bell (1970), The Greatest Gift (1974), The Disappearance of Flight 412 (1974), The 3,000 Mile Chase (1977), Police Story: No Margin for Error (1978), The Sacketts (1979), his last role was that of Rev. Rogers, in drama Final Verdict (1991). ↑ Cozad, W. Lee (2006). More Magnificent Mountain Movies: The Silverscreen Years, 1940-2004. Sunstroke Media. p. 124. ISBN 978-0-9723372-2-9. ↑ Wise, James E.; Rehill, Anne Collier (2007). Stars in Blue: Movie Actors in America's Sea Services. Naval Institute Press. p. 262. ISBN 978-1-59114-944-6. Wikimedia Commons has media related to Glenn Ford. This page was last changed on 15 August 2018, at 13:55.